OverDrive | Why is my cart total "TBD"? From the Carts page, click the cart with the "TBD" total to open its details page. Titles with unspecified lending models will be shaded in yellow. 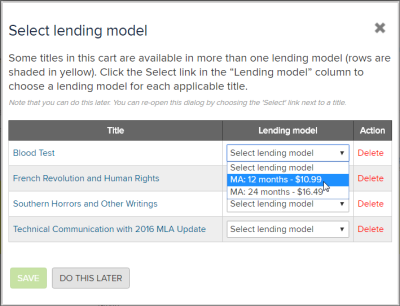 Click the Select link in the "Lending model" column for one of these titles. In the pop-up window that appears, specify the lending model for each of the applicable titles. Select Save to update your cart. After you've chosen a lending model for all the titles in your cart, you can proceed with checkout.